Summary: When former black ops operative Tom Steele and his partner Manning are assigned to decommission an old prison, they must oversee the arrival of two mysterious female prisoners. Before long, an elite force of mercenaries assault the prison in search of the new arrivals. As the true identities of the women are revealed, Steele realizes he’s caught in the middle of something far bigger than he had imagined. Dave Griffiths’s ‘Maximum Conviction’ Review: If you’re looking for a good B Grade (okay maybe that should be C or D Grade) action film, then you can’t go past straight-to-DVD Maximum Conviction, which might not necessarily be gold but will certainly cure your cravings. Maximum Conviction sees a crack squad led by Tom Steele (Steven Seagal – Born To Raise Hell, TV’S True Justice) and his partner, simply referred to as Manning (Steve Austin – Tactical Force, Knockout) sent in to a military prison with the orders to decommission it. However, things start to go wrong when two female prisoners, Charlotte (Aliyah O’Brien – A Killer Among Us, TV’S Eureka) and Samantha (Steph Song – Befriend And Betray, TV’S Endgame) arrive for ‘one night’. As Steele and Manning prepare for the decommission and the transfer of the last remaining prisoners, which includes some high-risk prisoners, things start going really wrong. Steele becomes convinced someone is hatching a plan when he discovers a hidden message, Manning becomes wrapped up with a faulty rubbish track and Samantha begins telling guards that she has been wrongly imprisoned and that she is actually a Government agent. Everything soon starts becoming a lot clearer when the prison is raided by a group of ‘bad guys’ led by Chris Blake (Michael Pare – The Philadelphia Experiment, Snapshot ). Director Keoni Waxman (Anna Nicole, TV’S True Justice) certainly seems to know his way around an action movie. For the most part the action sequences work quite well, although the tight budget means that many are just either shoot to kill or hand to hand combat, there is nothing that would have cost a lot to have filmed. Likewise screenwriter Richard Beattie’s (Dark Universe, TV’S True Justice) script takes the low budget into account as well. Although he does give the film it’s major plus side, the rather intriguing storyline that revolves around whether or not Samantha is in fact a government agent. It’s just a pity that Beattie seems to return back to the same one liners so many times throughout the film. Acting wise the huge surprise is Steve Austin who certainly seems to be one of the better wrestler-turned-actors. Sure he isn’t exactly performing Hamlet here but his performance is in fact credible. A minor disappointment however is Steven Seagal who seems to drag down some of the action sequences… his age is really catching up to him. 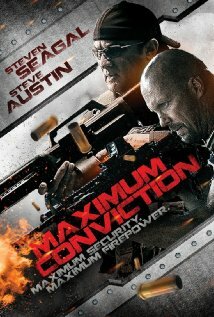 If you’re a diehard action fan you will enjoy Maximum Conviction just don’t expect anything great.